This is a virtual good, called a Rare Pepe. I blogged about it a few weeks ago. 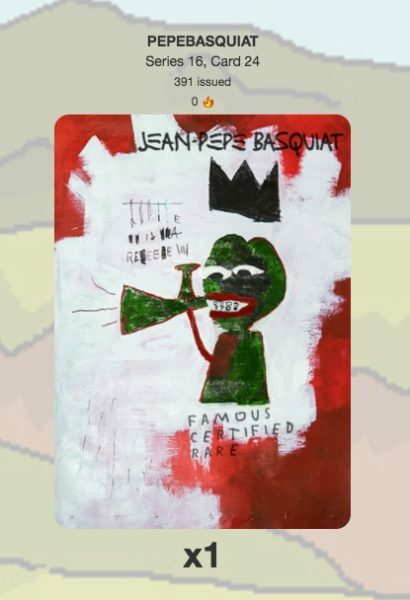 And I liked it so I went into the Rare Pepe directory, found the card, and offered 1000 Pepe Cash for it. 1000 Pepe Cash goes for $22.38 right now in the cryptomarkets. So I paid $22.38 for a virtual card that has no utility other than I can collect it (on my computer or phone), I can send it to someone else, I can sell it, and I can blog about it. But the one thing I do know is that these are “rare”. There are only 391 issued right now. And that is verified on the blockchain. Something to think about as it relates to digital media/digital art/digital music/etc which has been suffering from no scarcity value since the invention of the Internet.